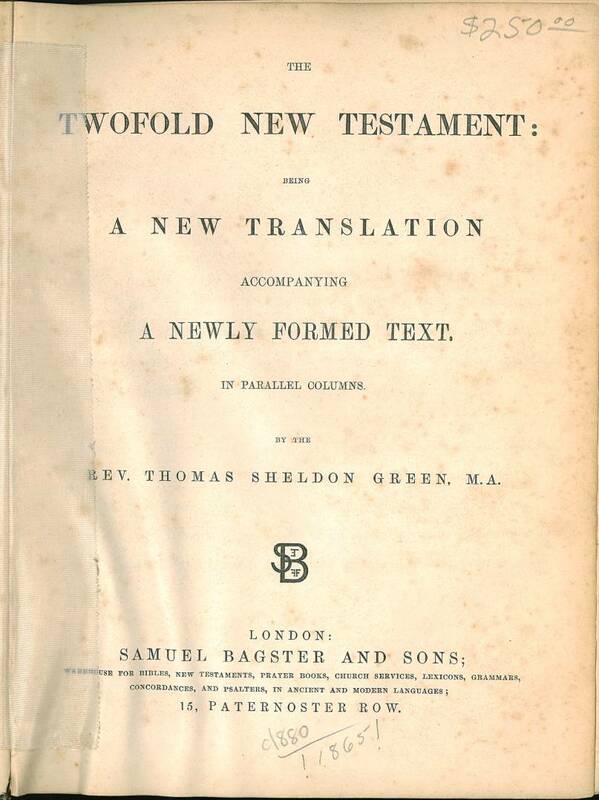 Title: The Twofold New Testament: Being A New Translation Accompanying A Newly Formed Text. In Parallel Columns. By the Rev. 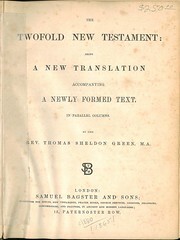 Thomas Sheldon Green, M.A. London: Samuel Bagster and Sons; Warehouse for Bibles, New Testaments, Prayer Books, Church Services, Lexicons, Grammars, Concordances, and Psalters, in Ancient and Modern Languages; 15, Paternoster Row. Date: Cited copy is undated except for a penciled in date of 1880, Herbert gives the date as 1865?. References: Chamberlin 558-1, Herbert 1959, Taliaferro-BVE CN00236, Taliaferro-EELBV 7500.